First the gluten, now this?!! The link between a celiac and hair loss isn't hard to come by. 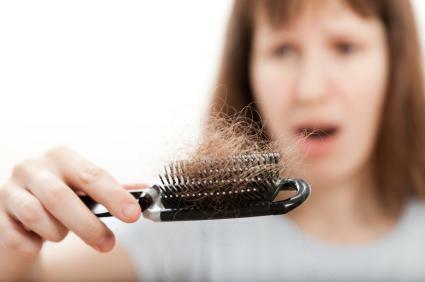 Hair loss is a very common condition in both men and women. However, many types of hair loss stem from different causes and untreated celiac disease can be implicated in more than one of these hair loss types. A celiac patient who has suffered through years of his condition untreated may experience overall systemic weakening. Celiac disease, when undiagnosed, can be very damaging. Repeated exposure to gluten may affect numerous bodily systems, though the most commonly reported problems deal with the digestive tract. Is Gluten Protein Absorbed Through Hair? Your intestinal tract serves as more than just a mere passage for food. It is responsible for the digestion of nutrients and it also harbors a great deal of beneficial microorganisms that play a role in the digestion and conversion of nutrients. For celiac patients, the ingestion of gluten triggers an immune system response which targets areas that host gluten molecules--typically the digestive tract. Unfortunately, this mysterious immune response tends to overlook the gluten and, instead, attacks the surrounding bodily tissue. Such attacks damage the intestinal lining and eventually eradicate the intestinal villi which are tiny hair-like projections that play an essential part in nutrient absorption. This kind of damage renders the digestive tract inefficient. Moreover, celiac-induced inflammation can tamper with the acidic pH of the intestinal environment which may affect the balance of intestinal flora. In short: untreated celiac disease can render an individual immunologically and nutritionally vulnerable. This vulnerability can leave a person prey to a number of secondary conditions. The factors such as weight loss, illness and nutritional deficiencies should be of interest to celiac patients as many celiacs will lose weight as a result of intestinal malabsorption, which results from their underlying illness. Each of these three factors are commonly present in celiac patients. So, if you are a celiac who is experiencing diffuse hair loss that persists over time, it may be due to the weakened state of your digestive tract. Intestinal malabsorption leads to a horde of nutrient deficiencies and hair needs to be fed just like any other bodily organ. Some celiacs are already in the treatment phase during which gluten has been eliminated from the diet, but still their hair loss persists. First of all, it is important to note that the body does not always heal automatically, nor does telogen effluvium correct itself overnight. However, should your hair loss continue in a diffuse pattern well past the advent of a treatment protocol, this could be due to secondary or completely unrelated medical issues. You may have a form of androgenetic alopecia in which the hair follicle responds negatively to free androgens in your bloodstream. This form of hair loss is the most common in men and requires a different treatment than does telogen effluvium. Any distressing health symptom should be brought up to your doctor. However, it will likely take a scalp biopsy to determine the exact cause of your hair loss. Your doctor may refer you to a dermatologist or perhaps even a hair loss specialist who can help ascertain the root of your problems and prescribe the most effective treatment. The good news is that, should your hair loss be caused by celiac-related telogen effluvium, a gluten elimination regimen accompanied by a nutrient rich diet will often promote healing over time. Supplementing with vitamins and superfoods may also help to speed healing and replenish your body's nutrient reserves.